Welcome to the new Croakey. After a long collaboration with Crikey – we posted our farewell to “old Croakey” last Friday and in the Crikey news bulletin yesterday – we have launched as a standalone platform. This is a somewhat daunting but also very exciting move, and we will be looking for your support and feedback in helping to make this transition, and to continue developing. While Croakey has operated with financial and editorial independence from Crikey since 2009, we are grateful for the support and collaboration of the Crikey team since 2007. This is your cheat’s sheet to the new site, just to give you a tour, and also a hint of what’s yet to come. As outlined in the Croakey story, we are calling ourselves “social journalism for health” because when I read an explanation of this emerging field of journalism last year, it rang an immediate bell: that’s what we do at Croakey. The Croakey project initially began as an intervention into public debate with the aim of encouraging a wider, deeper discussion about health – as outlined in this 2009 article in The Medical Journal of Australia, describing it as a novel collaboration between public health and journalism. Since then, we have continued to evolve and adapt, in response both to the digital dynamic and our funding constraints. Readers have become collaborators, working with us on projects like @WePublicHealth, #IHMayDay, The Health Wrap, the Gavin Mooney Memorial Essay Competition, and the Naked Doctor column, as well as crowd-funded initiatives like The Koori Woman columns, #WonkyHealth, #JustJustice, and #CripCroakey. We have needed the flexibility of our own platform for some time; winning a $5,000 journalism innovation grant from the Walkley Foundation earlier this year was a game-changer. What hasn’t changed, however, is our approach to covering health. We do not approach health reporting through a narrow clinical or disciplinary lens, but take a holistic view that recognises the health of individuals is connected to the health of communities, societies and the planet. Our work is underpinned by an appreciation of the importance of equitable access to health-producing environments as well as to healthcare, particularly primary healthcare. We look for health in all policies, not only from the health sector or health portfolios. • The ability to profile themes more prominently – for example, the #JustJustice project is currently featured. This will also be useful when we are covering conferences. If organising a conference or event that may be of interest to Croakey readers, you might like to consider enlisting the Croakey Conference News Service. Marie McInerney will be covering the Population Health Congress 2015 in Hobart next week. 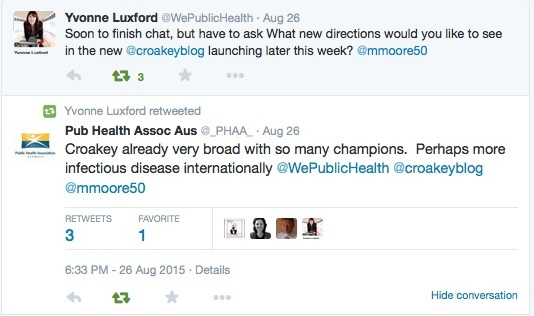 • A scrolling series of Croakey news updates on the right – inviting people to apply to tweet for @WePublicHealth, to submit entries to the $5,000 Gavin Mooney Memorial Essay Competition, and other Croakey news. 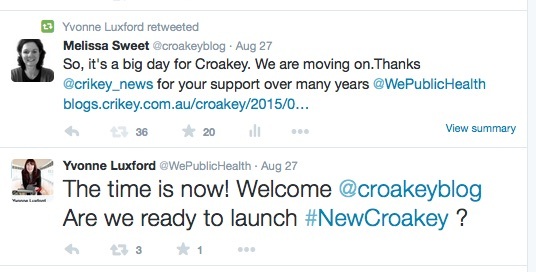 • Follow the new Twitter account @CroakeyNews – which was launched by this week’s Croakey editor, Marie McInerney. • Members of the Croakey funding consortium now have their own pages – where they update and maintain their own content. Check them out on the right of this page. We are looking for other members for the consortium – so please get in touch if interested. Membership is $2,000 per annum, and the consortium is organised by the Public Health Association of Australia, with an MoU recognising our editorial independence. • A Croakey calender of upcoming events (still a work in progress). • A list of recommended links and reading (still a work in progress; please send suggestions). • At the bottom of the home page, we have topical links to recommended external viewing and reading. This section will be expanded. If you come across material that may be worth featuring here, please let us know. “We are grateful when readers take the time to leave comments, particularly if correcting errors, pointing out omissions or contributing to informed debate. • We will be working with the Croakey connective and others to offer a range of professional services in line with our core mission of encouraging healthier public debate and communities. We will tailor these according to the needs of those using them. We are still developing this aspect of our work, and welcome your suggestions and advice on what might be helpful. • Testimonials – if you would like to contribute one, please get in touch. You are welcome to support, challenge or critique us. An excerpt from these also scrolls through on the bottom right of the home page. We have learnt a lot from collecting these about what people value in Croakey, or would like to see more of. Croakey is not an organisation in the conventional sense. We are a lean outfit with a small budget and no full-time staff, and are probably best described as “a connective” of people who work together on different projects. Check out the who’s who at Croakey. 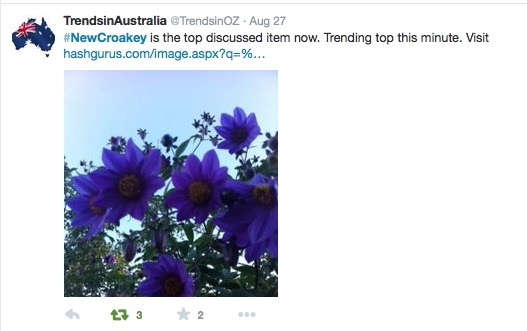 Thanks also to Dr Tim Senior for starting this Twitter list of the Croakey team. Follow our tweets here. A huge thanks to all members of the Croakey connective and collaborators. With core funding of $24,000 per annum, we rely on our engaged and contributing networks. Many thanks to Yvonne Luxford who guest tweeted for @WePublicHealth last week and oversaw the soft launch of this new site on Friday afternoon, conducting a series of Twinterviews (see some grabs at the bottom of this post). 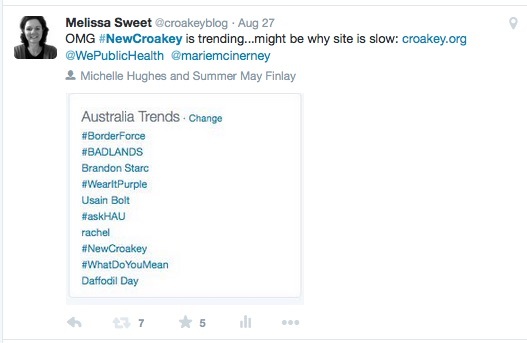 It was terrific there was so much interest that #NewCroakey trended nationally for a few hours – up there with #BorderForce (!) Apologies to those who then had difficulty accessing the site as the server struggled to cope with the demand. We have since shifted to another server, and hope that problem is now sorted. A huge and heartfelt thanks to designer and developer Mitchell Ward of Rock Lily Design whose talents (and patience) breathed life into #NewCroakey. • Behind the headlines – profiling articles from the archives as backgrounders for topics in the news. • Transparent, accessible, real-time analytics on the site and articles. We welcome your suggestions for what other features may be useful. And finally, it is coincidental but entirely appropriate that New Croakey has launched at the same time as the Mayo Clinic’s first international Healthcare and Social Media Summit is being held this week in Brisbane. We are delighted that Summer May Finlay, a Yorta Yorta woman, public health practitioner and a member of the Croakey team, will be presenting tomorrow on the #JustJustice project, which is investigating ways to stop the over-incarceration of Aboriginal and Torres Strait Islander people. As well, Melissa Cadzow is live-tweeting the conference for @WePublicHealth from a health consumers’ perspective. Follow #MayoInOz for news from the conference, and there will be more to come about this at Croakey. Meantime, some of the #NewCroakey launch tweets – thanks for participating.